L-R: Dr. Kimberly Jensen, Mary Beth Herkert, Sunny Petit, Nova Newcomer, Tayleranne Gillespie, and Zacahary Jones. 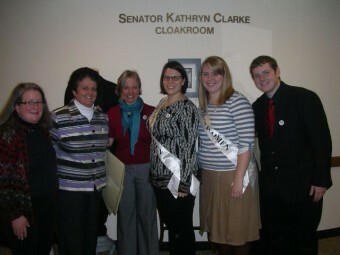 The Senate Rules Committee held hearings Friday, February 3, 2012 on Senate Concurrent Resolution 204, which “Commemorates the centennial of woman suffrage in Oregon and efforts of those who led woman suffrage campaign of 1912.” Western Oregon University students Tayleranne Gillespie and Zachary Taylor testified about the importance of the centennial for them as students, and their contributions to the Century of Action website content under the guidance of Dr. Kimberly Jensen. Mary Beth Herkert, State Archivist, brought the original equal suffrage proclamation written by Abigail Scott Duniway and signed by Governor Oswald West, along with Duniway’s voter registration card. Sunny Petit and Nova Newcomer of the Center for Women, Politics and Policy focused on the importance of the centennial for future generations and the next hundred years of activism. To read the full text of Senate Concurrent Resolution 204 click here. 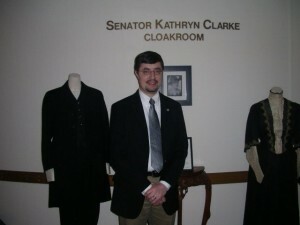 This group was also treated to one of the first tours of the new Senate cloakroom dedicated to Oregon’s first elected female senator Kathryn Clarke. Tour guide was James Goulding (pictured below) the Senate Reading Clerk. Thanks to Senator Diane Rosenbaum, Senator Ted Ferrioli, and Greg Leo of the Oregon Republican Party for their support in honoring the centennial of Oregon woman suffrage with Senate Concurrent Resolution 204.